Tuition and fees are subject to change at any time by action of the College Board of Trustees. Tuition for in-district students under age 60 is $140.00 per semester hour. 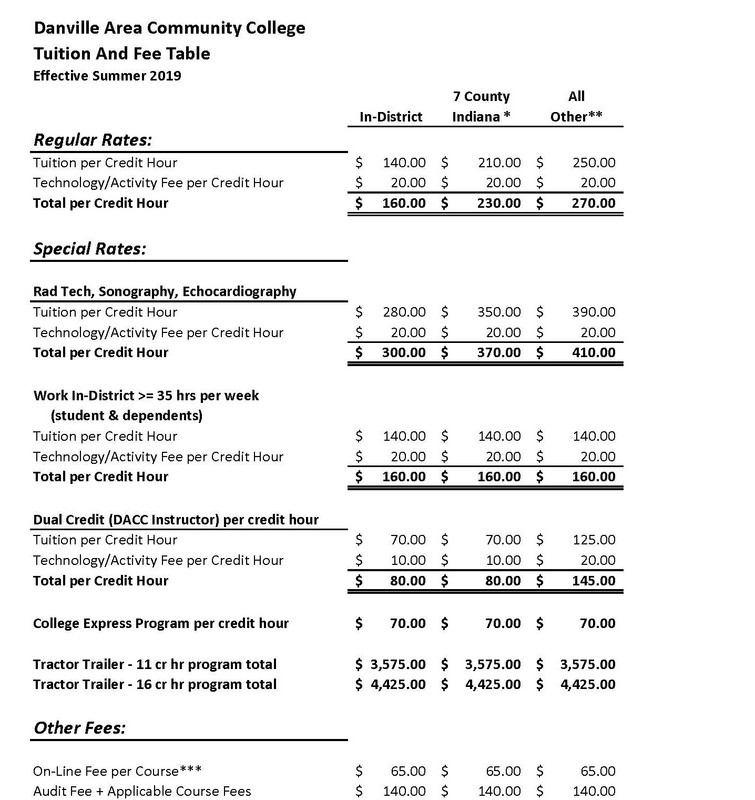 Tuition for out-of-district students with authorization for partial student support from their community college district local Board of Education; or their district Community College Administration $140.00 per semester hour. Tuition for out-of-district students without authorized partial student support $250.00 per semester hour. Out-of-district or out-of-state but employed 35 or more hours per week in-district $140.00 per semester hour for students and dependents. Tuition for out-of-state students $250.00 per semester hour. Tuition for out-of-state Indiana students residing within a specially designated 7 county area (counties include: Vermillion, Parke, Fountain, Warren, Tippecanoe, Benton and Montgomery) $210.00 per semester hour. Tuition for international students $250.00 per semester hour. Radiologic Technology and Sonography Programs - $280.00 per semester credit hour for in-district students, $350.00 per semester credit hour for Indiana students residing in the 7 county area, and $390.00 per semester credit hour for out-of-district students. The Technology/Activity Fee of $20 per semester credit hour applies to all students. Tractor Trailer Driving Program for the 11 credit hour program - $3,575.00 total. For the 16 credit hour program - $4,425.00. Fees for non-credit courses are based on the nature and length of the course. The tuition rate is not applicable to these courses. Out-of-district students pay the same fees as in-district students as these classes are self-supporting. All students, regardless of residency status, will be charged a $20.00 per credit hour Technology/Activity Fee. Many courses require a course fee in addition to tuition and other fees. Course fees (Spring 2019) vary. They cover the cost of materials, lab equipment, special services and other costs. Students will be billed for any breakage of laboratory equipment. Payment for breakage must be made before term grades are released. Official Transcript of Credits...$5.00 each copy. Auditing, plus applicable fees, per semester hour...$140.00. Proficiency examinations minimum of one credit hour of tuition. Graduation fee (cap and gown rental) . . . approximately $40.00. All fiscal obligations due the College must be cleared prior to registration for a subsequent term and prior to graduation. Proficiency Exam Fee: The fee to take a proficiency examination shall be a minimum of one credit hour tuition or one-half the current tuition of the college for the that course, whichever is greater. Course Repeat Fee: if a student chooses to repeat a course "after" the number of approved repeats has been completed, a course repeat fee will be added to the residency-based tuition rate. The fee is equal to the State apportionment for the course, rounded up to the nearest dollar per credit hour. Students may consult the Director of Admissions & Records/Registrar for course repeat fee is not an allowable fee for student financial aid. However, the fee can be deducted from any refund a student may be getting. In-district students will be charged $140.00 in tuition per semester credit hour; all other residency students will be charged $210.00 per credit hour. All students will be charged a fee of $65.00 per course plus a $20.00 technology/activity fee per semester credit hour (some exclusions apply). Tuition and fees are due and payable 10 days before classes start, unless the student has already signed up for DACC's payment plan with Nelnet Business Solutions (NBS). Information about NBS can be found here. Access to account activity and current balance is available on-line only by signing into the Student Services Jaguar Spot. Payments are accepted at the Cashier's Office via cash, check, Mastercard, Visa, or Discover (service fees apply for credit card payments). Students may also pay by signing into the Jaguar Spot for on-line payment options. A student's billing account is considered financially cleared and paid timely if financial aid has been awarded, scholarships accepted, or the payment plan has been initiated 10 days before classes start. By registering for classes at DACC, the student accepts full financial responsibility for payment of all amounts due by the applicable deadlines. The student understands that failure to pay past-due debt may result in referral of the account and will result in restrictions on the student's ability to register for future classes, receive official transcripts and other College services. DACC actively pursues outstanding balances and uses all means necessary as allowed by state and federal law to collect amounts due to the College. All refunds will be issued through the Business Office periodically throughout the semester. No refund of tuition or fees is made when a student is expelled for disciplinary reasons. Refunds for dropping individual courses will be made at the same rate as for withdrawal from school. Refunds may be processed by check or posted to credit card. All tuition and course fee refunds are based upon total monies due the College. If a student officially withdraws from a course during the registration period or before classes officially begin, he/she shall be entitled to receive a refund of 100% of tuition and course fees paid or payable. It is the student's responsibility to drop classes. A soldier ordered into service by the Governor is eligible for a full refund or credit if he/she is unable to attend college for a period of 7 days or more. Classes Meeting Twelve Weeks or Longer Including Corporate and Community Education Classes. If the withdrawal occurs during the first 10 business days, tuition and course fees paid or payable will be refunded. There is no refund of tuition or fees for withdrawal after the refund period. If the withdrawal occurs during the first 5 business days, tuition and course fees paid or payable will be refunded. The Department of Education mandates that unearned federal financial aid funds are returned to the specific programs if a student withdraws from a semester. The amount of the refund is determined by the days of the semester that the student was in attendance verses the remaining days (after withdrawal) until the semester ends.